Most expensive lodging, per person – $32 at the Royal President in Bangkok. I had just gotten out of the hospital in Nepal and we decided to treat ourselves to a few days at a proper hotel. It was lovely. 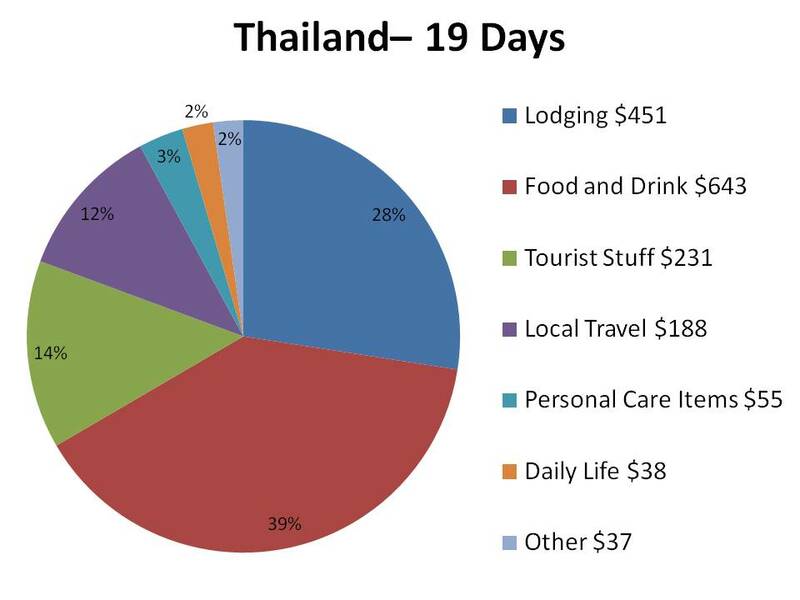 Least expensive lodging, per person – It’s a tie at $6.50 for a fan room that was pretty basic at SB Cabana II on Koh Tao, and an air-con room at a dive hostel in Bangkok that was also pretty basic. $1 Pad Thai on the street. Practically everywhere you look, you’ll find the super-cheap pad thai carts. They aren’t always great, but they are a great value for a huge pile of noodles with veg, and chicken/beef/prawn on request. Barracuda on Koh Tao – This place is run by a chef who worked for my brother when he had his restaurant on Koh Tao, and it’s easily the best place for a nice fish meal on the island. Their appetizers are to die for. Lung Pae on Koh Tao – It’s is a bit out of the way, high up on a hill with a great view of the ocean, which makes it perfect for a sunset dinner. If you don’t have a scooter, they’ll come pick you up. 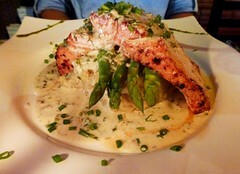 Interestingly enough, even though it’s a Thai place, they are best known for their steaks, particularly menu item # E4. Portobellos on Koh Tao – Craving Italian? This is the place to be. Excellent thin crust pizzas and a decent wine list. Sunday Roast at Banyon on Koh Tao – Obscene amounts of comfort food for when you are feeling particularly homesick. It’s a local’s hangout so you’ll likely encounter bar and dive staff from all over the island at this weekly feast. Going to the movies in Bangkok –There are massive movie theaters at the tops of nearly all the big shopping centers in the Sukhamvit area. These are no ordinary theaters though, and they range from huge and classically decorated to enormous and lavish rooms filled with couches, soft lap blankets, and bottle service. You can choose your level of service/quality of seat (and believe me, even the regular seats are generally nicer than those you’ll find in the States). It’s a perfect way to deal with a rainy afternoon. Don’t forget to stand for the national anthem…for real…it’s the law. Massage parlors literally line the streets! 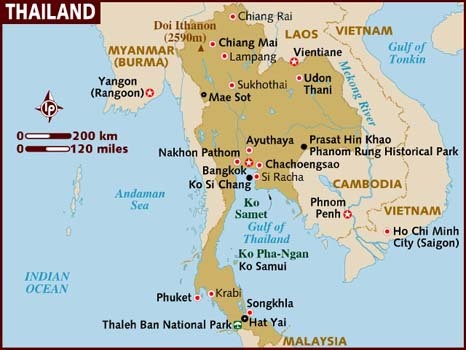 $6 massages – Massage parlors are everywhere in SE Asia, and Thailand is no exception. They run the gamut from sleazy ‘happy ending’ factories, to luxury spas that will pamper you for hours. We stuck to crowded places with a communal area for Thai massages (no happy endings possible in these!) and if one massage wasn’t that great, we just went for another with a different masseuse! If you want a super luxury deal (so, not $6) at a fraction of what you’d pay in the States, head to the Jamakiri Spa on Koh Tao. They’ll come get you for free and you can spend the day getting pampered, and then relax by their pool that overlooks Sharks Bay. Getting random jumbles of noodles with fish sauce at a ‘Pad Thai’ cart in Bangkok. This happened more than once. Watch the cart before you order to see if they are really making Pad Thai or if they are just dishing up mixed noodles and veggies to drunk tourists. They are fabulous, take 5 or 6 of them! grasas almacenadas. Aporta mil quinientos mg de L-carnitina por dosis.